The new dance hall and banquet room in connection with Marmora Heights Restaurant will have its grand opening tomorrow evening, Dec. 18th.The hall has been named the Relm Club and will cater to banquets, dances and other special events. The new building has been erected by Mr. Russ. Jarvis at the west side of Marmora Heights Restaurant and Mr. Jarvis has spared no expense in providing the finest accommodation in the area. The new addition is 40 ft. wide and 105 ft. long and is of cement block construction with a flat roof. The interior is finished with stained and varnished plywood walls, ten-test ceiling and a beautiful hardwood floor. A stage is set at the extreme west end, raised above the floor level and lighted with rose and green colored lights which can be varied to provide different effects and .gives a very attractive setting for the orchestra. There rare recessed lights in two rows in the ceiling, the length at the building and coloured spot lights in sets down the centre. Fluorescent tube lights are fastened at intervals along each wall. At the east end next to the restaurant, there is an attractive lobby, a cloakroom and washrooms for ladies and gentlemen, complete with modern fittings. The kitchen in the restaurant part has been increased in size and will now extend the full length of the restaurant taking in the room formerly used for displaying novelties and fishing tackle and being connected with the new room. Pink & black - like this? 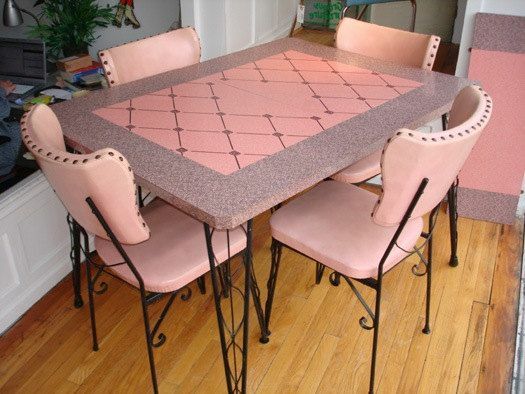 Attractive new tables and chairs have been secured, the tables having a pink arborite top and black wrougt iron legs, and the chairs are of a type that can be conveniently stacked when not required. It is estimated that they can accommodate about 300 people at one time. READ MORE ABOUT THIS BUSINESS AND OTHERS TO THE WEST OF MARMORA.